View the Gullah Island Slideshow Here! And so the journey began around 4:45 a.m. on Thursday. My husband, son’s Godfather, adopted Auntie, her brother, and his two daughters all came with my family to South Carolina. In addition, seven other families, all members of the Southern DC Chapter of Mocha Moms, came from D.C. as well. My husband, a reluctant urbanite, born and raised in South Philadelphia, had not camped since grade school and wasn’t really thrilled about sleeping outside. Nevertheless, he and his traveling companions were the first to arrive on Hunting Island. They even had time to get a private tour from the Park Ranger! In fact, based on his enthusiasm and how he welcomed everyone to the campsite, you would have mistaken him for an organizer. The mommy vans arrived an hour or so later. When we pulled into Beaufort, South Carolina, it was an awesome feeling to be on the land of the Gullah people. Our D.C. planning committee had viewed the film “Daughters of the Dust,” that week so the images were fresh in my mind. The moss trees, the swamps, the prayer houses, and the little white store with the sign that said “Authentic Gullah Food,” welcomed me to what felt like home. The campsite won me over immediately. We walked through woods, down a hill, to what looked like a little piece of Africa. During the tent set ups, the women in my party commented about how being outdoors brings the protector out in the men. After putting up our tents, my husband and the other men from D.C., went around helping anyone who needed assistance. It reminded me of what my grandmother called the “good old days,” when neighbors helped each other matter-of-factly because that’s just what you do. By nights end, the campsite resembled what I believe a tiny African village would look and feel like. My tent/hut was surrounded by friends and family. When Angela Ewing-Boyd from D.C. needed someone to hold the baby, no worries, there was someone within arms reach to help out. The children needed no introduction only the sight of one another. They played endlessly and harmoniously without computers, without Game Boys, and without gadgets. Nature provided the perfect playground. Zion’s adopted Auntie Carla commented that these were some of the most incredible children she had ever met. She was amazed by the maturity, the manners, and the peaceful nature the children exhibited. On Friday our group made it to the Gullah Festival. The vendors were great, but many lamented that the festival was very commercial and didn’t feel cultural. But the group barbeque on the beach more than made up for it. The Gullah Island trip chef, Erika Davis Pitre kept the conversations lively as she shared with us about her travels in Europe. Afterward, my family’s tent became the hot spot. Kwame Ansah, from D.C., pulled out a deck of cards and a spades game in the woods was on! The crickets had to compete with the music of R&B crooners Maze during the card game, nevertheless it was a sight to behold, especially for the children. They had an opportunity to see families just like theirs who homeschool. The evening ended with an impromptu sister circle that included the women from D.C. and one of our organizers, Regina Dyson. We talked about toxic cities and creating a community of our own in places like Belize or St. Croix. Finally, we were all lulled to sleep by the black sky, the stars, the bull frogs and the absolute peace of being in nature. Saturday morning began with a morning walk on an incredible beach with what looked like uninhabited shorelines for miles and the most stunning trees I’ve ever seen. There were only a handful of us able to pull ourselves out of our tents that early (before 5:00 a.m.), but it was worth the interruption of sleep. Watching the sunrise and standing in waters that we know carried our ancestors from West Africa was chilling. As I looked up and down the coastline all I could think about my ancestors who had made this place home before they were disturbed by developers. After the sunrise watch, I returned to sleep only to be awakened by the pancake lady. The amazing Erika cooked pancakes for nearly the entire campsite. My son awoke and hurriedly dressed. I promised him I would follow soon to be sure he ate. In a village, however, a mother never has to worry about whether her son has eaten. By the time I was dressed and out of my tent, my son had already found a family to “break bread with.” When I chastised him for intruding, I was assured that he was fine. I walked away thinking that this is what my ancestors meant when they said it takes a village to raise a child. Each night ended with the children around the campfire and more uninterrupted adult conversation about everything from, of course, homeschooling to the reoccurring topic, creating our own intentional community. An hour would go by and I would check for Zion. Then it dawned on me. I felt so comfortable and secure with him playing nearby with the other children in the sand pit. My heart yearned for this kind of community all year round. 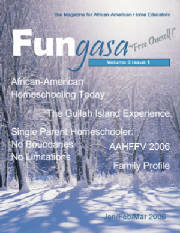 Traveling to the Gullah Islands one was of the most memorable experiences of my life, and being with other homeschoolers made it even sweeter. Many of the families who came from D.C. were not homeschooling, but we made an incredible impression.